Pileus is a giant mushroom in the far East of the map. It is found on a small mushroom island with giant mushrooms of both types. There is a wooden stairway wrapping around Pileus which leads to a village constructed under the mushroom's cap. The island contains giant red mushrooms on the West and giant brown ones on the East. Be careful when tackling the zombies as there is a danger they will knock you down to ground level. Going to Pileus can be essential if you're traveling through the far East. There are many chests that spawn food here, so stock up! PurpleSunshine Humble Abode is close by. If you have a wooden hoe, you can get many red mushrooms and brown mushrooms at the bottom of Pileus. Be aware that Pileus has no crafting table, in order to craft cookies and bread you will have to go to another location, the nearest crafting table is Fort Rockwood to the South. The town is hanging from the top of the mushroom, so almost all drops are deadly; watch your step! The holes on the walkways can be used to your advantage by knocking zombies or players into them. Small-medium teams of people sometimes camp here, mostly bandits from the north looking for food. Good location to camp since it has weapons, food and water. Pileus is one of the last great food spots before going into the dangerous Northern parts of the map like Zerbia, Floating Islands, Al Hasa, and Agni Ignis. 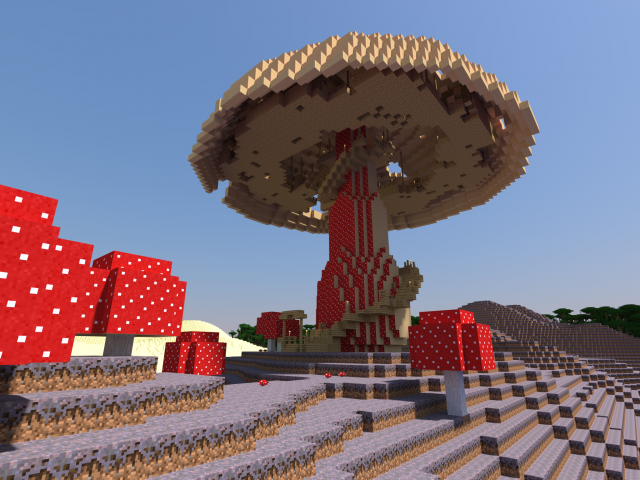 Pileus's top used to be brown when it was first added as a build submission by Ipchaon, although the builders decided to change it to a red color because it fits the actual vanilla red mushroom better. The pileus is the horizontal portion of a mushroom, otherwise known as the mushroom's cap. AquaIsAquatic and IAmAPancakee like this.